A new exhibition ‘The Ingram Collection: Skyscapes’ at The Lightbox gallery and museum in Woking, Surrey, will bring together Modern British Art with extraordinary works of art developed by groups from the local community. Print-maker Tozzy Bridger, along with installation artists Jono Retallick and Mary Branson, have worked with people with learning difficulties to produce artwork that will feature in the exhibition alongside the stunning skyscapes from The Ingram Collection of Modern British Art that inspired the works. Pieces that have provided inspiration and will be on display in the exhibition will include; ‘Chemist’ and ‘Coachbuilder’ by Eric Ravilious, ‘Holiday’ by John Tunnard, ‘Glastonbury Fen’, ‘Landscape with Buildings’ by Tristram Hillier as well as ‘The Kite’ by John Minton. ‘The Ingram Collection: Skyscapes’ is presented in association with the Paul Hamlyn Foundation as part of the ‘Our Museum’ initiative and Chris Ingram, owner of The Ingram Collection, has generously made his works available both for the workshops and for inclusion in this exhibition. ‘Our Museum’ is a Paul Hamlyn Foundation funded three-year scheme involving nine museums and galleries across the country. This initiative focuses upon helping organisations to improve the ways in which they engage with their local communities. Marilyn Scott, Director of The Lightbox, commented: ‘We are as ever most grateful to Chris for making his collection available – his generosity and the open and accessible way he allows us to use the collection is incredibly enlightened and an example to all museums in showing how art can be used to inspire creativity in those people who might not usually have access to precious collections’. With the aim of encouraging local engagement, The Lightbox approached a number of community groups who work with people with learning difficulties and those that were interested in participating were encouraged to devise their own idea for a collaborative project. The groups that took part in the project are LinkAble, Cranstock Day Centre, Activity Extra, Geesemere, Lockwood Day Centre and The Harbour Day Centre. A hands-on project involving print-making and sculpture was decided on with the theme of ‘Skyscapes’. 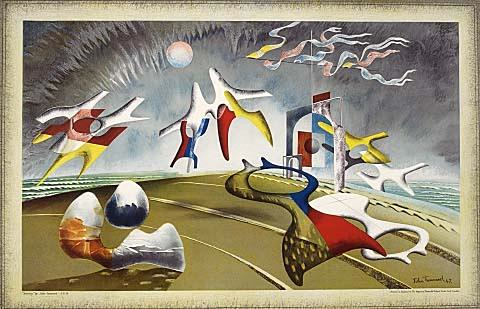 Pieces from The Ingram Collection of Modern British Art were chosen to be used as inspiration for the groups and workshops were run over a period of several months. The result of this work is an exhibition of intriguing and beautiful skyscape prints and an installation of extraordinary columns of cloud floating in ever-changing light that will be shown alongside the skyscapes from The Ingram Collection that inspired them. ‘The Ingram Collection: Skyscapes’ will be on show in the Upper Gallery at The Lightbox gallery and museum from 10 May – 26 June 2014, entrance is free of charge.